It recounts a celebrated court case of Judge Bao of the Song Dynasty, a magistrate who stood above the corruption of his time and is still revered throughout the Chinese speaking world for his wisdom and fairmindedness. Yangtze Repertory Theater of America will present the world premiere of the adaptation, directed by Chan, May 3 to 20 at Theater for the New City, 155 First Avenue, NYC. 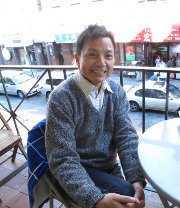 The production will star Mr. Denver Chiu (of Hong Kong) in the female role of the heroine, performing her arias in Cantonese Opera style. He is credited with having single-handedly revived the art form of men playing female roles in Cantonese Opera, which has been absent from the world stage for over 60 years. The arias have lyrics and choreography by Chen ShaoMei (of GuangZhou, China). The play will be performed in English, Mandarin and Cantonese with Chinese and English supertitles. Aiming to remove Begonia as a threat of inheriting the Ma Family’s fortune, she accuses Begonia of adultery and poisons Official Ma. She then blames Begonia for the crime and claims to a court that Shou Lang is her own child. As Begonia is about to be executed, she is rescued by Judge Bao, who discovers Mistress Ma’s deception with a wisdom worthy of King Solomon. The overall style of the play is earthy, which is characteristic of the stage of the Yuan Dynasty. Even with its tragic central story, there is still slapstick as well as mime and acrobatics. The setting is basically a bare stage. These elements are typical of stage creations from different regions in China, which are loosely known as Chinese opera. There are six leads and an ensemble of eight. The heroine’s arias are the only sung portions in the original play. There are no surviving records of how they were originally performed 800 years ago. Using standard Cantonese opera repertoire, Chen ShaoMai transcribed the ancient lyrics into colloquial Cantonese for the production. She has been a Cantonese Opera actress since 1957 specializing in the Warrior Heroine part and has been a director and choreographer in her later career. Denver Chiu before rehearsalin NYC, on balcony of Lin Sing Association, Mott Street, Chinatown. Photo by Jonathan Slaff. Judge Bao will be played by Bill Angst, a towering caucasian actor who was born in Xian, China and grew up in Beijing. The cast also includes Shang-Ho Huang, Shu-Mei Kwan, Sajeev Pillai, Al Parrick Jo with Hugh Cha, Mayu Iwasaki, Lao Shi-Yan, Phillip Lung, Hannah Scott, Karen Stefano, Kevin Taejin, and Viet Vo. Set is by K.K. Wong, who collaborated with Joanna Chan at Hong Kong Rep in the 80’s. Lighting design is by Joyce Liao. Choreography is by David Shen. In addition to the accompaniment to the Cantonese arias by musicians in China, an original score is created by Su Sheng. 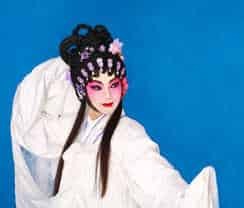 Cantonese Opera is not as well known in the West as the closely related Beijing opera, but is still a vibrant art form wherever Cantonese speakers live. Based in southern China and overseas ethnic Chinese communities, it is a very formalized operatic form that combines singing, mime, gymnastic and martial arts skills. It predominates in Guangdong (formerly called Canton), Hong Kong, Macau, Singapore, Malaysia, and in Chinese-influenced areas in western countries. As in operas of many other regions in China, it employs elaborate makeup with different shades of color and shapes indicating the social standing, mental state, trustworthiness, and physical health of the characters. Joanna Chan (author/director) co-founded Yangtze Repertory Theatre of America (www.yangtze-rep-theatre.org) in 1992 to produce works for and by Asian artists. Since then, the company has become New York’s most significant entry point for dramatic works from Chinese-speaking countries and a place of collaboration for artists from various parts of Asia. Her own plays also include the political and controversial drama, “The Soongs: By Dreams Betrayed.” Her “One Family One Child One Door,” a black comedy on the human cost of China’s one-child policy, premiered in 2001 and was revived twice. It was a finalist in the Jane Chambers Playwriting Contest. Chan’s 1998 drama, “Crown Ourselves With Roses,” was selected as one of 23 most significant works in Chinese theater in the past 100 years for “An Anthology of Modern Chinese Drama” published by Columbia University Press in 2011. An English version of her 1985 drama, “Before the Dawn-Wind Rises,” was included in “An Oxford Anthology of Chinese Contemporary Drama” in 1997. Most recently she was commissioned by Hong Kong Repertory Theatre to write and direct “The Empress of China,” based on the first encounter of the American and the Chinese people in 1786, which received its premiere in Hong Kong in January last year, followed by a New York production in June 2011. Yangtze Repertory Theatre of American will present “The Chalk Circle” May 3 to 20, 2012 at Theater for the New City (Cino Theater), 155 First Avenue (at E. 10th Street), NYC. Performances are Wed. – Sat. at 8:00 PM, Sun at 3:00 PM. General admission tickets are $25 (Wednesdays: Pay what you can); Student/seniors and groups of 10 and above are $20.00. The box office phone number is 212-868-4444 (Smarttix-English), 718-300-6754 (Chinese); you can buy tickets online at www.yangtze-rep-theatre.org.